Project Cost Management is a powerful solution platform that engages estimating and progress measurement with real-time integrations for total project oneness. The HD solution embodies Project Cost Management to create more than a plan, instead it makes projects dynamic. Track actual costs and gain total project confidence in cost estimating, productivity management and earned value with HD. The HD solution is a full service Project Cost Management suite that bridges cost modeling with the project schedule to track overall productivity. Built for efficiency, HD is equipped with practical tools that keep your project organized and profitable—simply, reliably, and accurately. Tap into real-time visibility of actual project facts and figures with HD. Front-line employees can now accurately estimate, manage and accumulate critical performance history to deliver successful projects. Organizations use HD to reduce the time it takes to build accurate estimates by 300%, increasing cost accuracy, speeding up customer response times, reducing administrative expenses, mitigating risk and improving profit margins. View and edit projects with HD for total collaboration with all project members to ensure information is always up-to-date. From planning to completion, HD allows all aspects of the project to be clearly visible with real-time facts and figures. Improve the effectiveness of project planning and execution by consolidating all project information. Utilize HD tracking features to highlight any potential overruns to increase total productivity. HD is packed with resource management tools that are fully customizable, with unlimited resource-level cost detailing. HD estimating software is an easier, powerful and more refined way to manage cost and productivity for enterprise level projects. This next-generation technology delivers a wide range of collaborative tools to increase accuracy with centralized data and unlimited resource-level cost detailing. The compatibility of HD integrates project portfolio systems, which together revolutionize and standardize the estimating process. HD makes it possible to analyze and manage the best combination of quotes in more ways than ever before, helping make better, smarter estimating decisions. This feature allows you to send quote requests to all or select vendors by email or fax, while including an unlimited number of resources and cost items for each. Through this comparison tool, HD estimating software gives you more efficiency and flexibility to accomplish your goals. Both organization and credible information are crucial to the success of a strong bid. The HD solution ensures this with a centralized view and historical databases; together this provides a simpler layout and easy access to an archive full of historical accuracy. HD estimating software provides a comprehensive list of data libraries designed to help you grow your estimates. Multiple libraries are available in every project sector including: Infrastructure, Environmental, Oil & Gas, Utilities, Industrial and Mining. Information is updated and automatically provided for thousands of cost items and assemblies from Richardson or RSMeans. If ever necessary to manually enter information into an estimate, HD makes this process seamless through active links to Microsoft® Excel. In every project stuff happens and conditions change, but HD estimating software is there to help you manage and account for all factors that may adjust production rates including weather, geography and other job specific conditions. HD provides resource categories placed in a single, easy-to-access location to better organize and manage resources. By creating pre-defined crews and assemblies (groups of resources), you may instantly employ and view the information as a single line item or expand to show individual resources. As rates change, adjust them on a job-by-job basis without effecting master rates. Save time and improve rate accuracy. Copy the job specific resources to master files, and from one job to another. 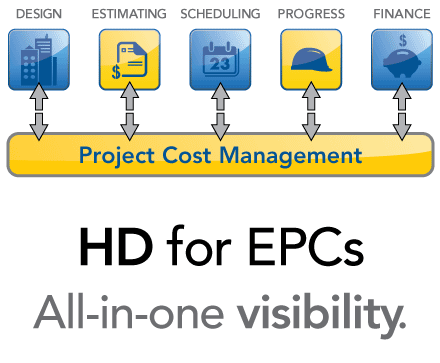 Spreadsheets with complex linking and formulas can make projects a hassle, but HD estimating software offers the best of all worlds: enhanced features to break down cost into ultimate levels, side-by-side comparison of conceptual and detailed project phases and maximized project accuracy, complete with labor, equipment and material resources. Define mark-up and overhead in numerous ways with HD estimating software, and spread profit and overhead proportionately over all estimate items with a single step. The powerful Auto price tool manages overrun and under run items. HD gives you the ideal place to store and view all contacts from Microsoft® Outlook or any other existing database. This is sure to save you time by viewing all subs, suppliers and contacts in a master address book. Designed to be intuitive and simple, HD estimating software has proven this through the integration with Microsoft® Excel. Done in real-time, you can link any HD field with an external spreadsheet saving time, increasing accuracy and incorporating the results of proprietary legacy spreadsheet data. HD estimating software drives simplicity with access to over 100 pre-built and customizable reports on all cost and resource data. These ready-to-go templates include resource utilization, cash flow, subcontracted items, detailed productivity and costs. Web-based reporting and dashboards get you going and stay relevant as your data grows. Progress measurement analysis will be accurate. Cost will be managed. Productivity will be increased. And HD will be the solution. Award-winning HD progress measurement software has redefined enterprise level project management through its one of a kind technology. Owners and contractors can pro-actively oversee all aspects of their project with real-time data from the field. From start to finish, HD progress measurement promotes growth and a complete Project Cost Management experience. With just one click, make all aspects of your project easy to understand with innovative yet simple data. Centralizing progress measurement methods, HD fully updates Percent Complete, Budgeted Cost of Work Scheduled (BCWS), Earned Value, Actual Cost of Work Performed (ACWP), Cost Variance, Estimate at Completion (EAC), and Forecast Variance. Eliminate endless piles of timesheets with easy-to-use, fast and powerful HD timesheet management. This feature has everything you need to enhance, organize and advance timekeeping. In seconds, man-hours, equipment hours, progress quantities, actual costs and notes can be sent back to the office. HD progress measurement is also compatible with other systems through an API service for data collection from any XML source. This one stop shop gives you the opportunity to store and export timesheet data to any accounting system saving time and money. HD focuses on the foundation of your project: the Budget. The HD solution provides the best way to analyze actual data from original cost model estimates. Building better accounting practices, HD progress measurement gives you total budget visibility at any stage of the project. Once a project begins, fewer hurdles stand between you and success. HD simplifies the resource management process by assigning actual labor and equipment as specified in the estimate. Connect from anywhere with a calendar-based web tool to schedule, filter and manage all resources. Built-in automatic alerts resolve conflicts for over-allocated resources ensuring accuracy. As projects grow, pay requests and approvals can seem to get out of control, but HD progress measurement easily regulates the process with a one-time set up that will constantly monitor work completed. Accomplish more with an automatic calculation of earned revenue and payments owed. A picture is worth a thousand words and HD Projectfacts analytics and reporting software does just that. Measure results at a glance, comparing internal goals to actual performance. Slice and analyze data at any level including, division, branch, geographic region, customer, crew, cost item, time, weather, zip code or any other data point tracked. Executive dashboards provide graphic representations of key business metrics important to monitoring business health and gauging future performance. Easily determine the number of bids out, percentage of bids won, drill down into production values, resource utilization and more. Look ahead and forecast costs at completion before the project closes, providing visibility into unit costs and productivity measurements such as crew, labor and equipment. Reduce the time it takes to forecast the cost of a project during the project, and at completion. Reduce days to minutes with powerful forecasting tools. Utilize historical project averaging data to accurately estimate future projects eliminating the spikes and fluctuations that typically come with using historical costs as a reference source. View project components that could potentially exceed budget projections before they occur. Thresholds against expected values provide information to make faster decisions to prevent unnecessary expenses and allow for strategic planning adjustments. Percentage of completion is easily tracked and viewed at set milestones to catch variances early on and take corrective action in order to proactively correct potential issues. Update schedules as changes occur without starting from scratch to save time and eliminate potential errors. Dashboards and charts provide answers in seconds without spending time reading through endless reports. Visualize graphs that highlight problem areas quickly, including budgeted vs. as-built values. Notification alerts on key areas are configured to identify potential problems in any area, notifying the right people at the right time. Create reports at any level for individual projects or aggregated, in any way such as by division, by customer, or by region. Activities can be separated within the hierarchy tree. Change logs kept on all project changes provide comprehensive historical reporting and assist with shareholders, bonding agents, banking institutions, and IRS requirements. Gain end-user adoption and fast ROI with familiar views and reports. Enable power users and new user's specific views to match expertise. Define "corporate standard" views and reports specific to each user type, creating smoother adoption by users and less technical support. Allow users to customize their own views and reports. Project changes that require change orders or budget updates are estimated in detail and tracked separately in the project, along with a detailed audit trail. Track changes to bids, material price changes, contractor changes, and eliminate the guesswork of how a project changed. The system complies and meets Sarbanes Oxley title IV requirements with enhanced reporting requirements for financial transactions within a project, including internal controls for assuring the accuracy of financial reports and disclosures, and both audits and reports on those controls with project transaction and change logs. It also meets timely reporting of material changes within a project that effect financial conditions as a result as well as specific corporate reporting. The 5D-BIM Server provides dynamic “Oneness” integration between design, estimating, scheduling, progress, and finance resulting in 100% project visibility, increased profits, decreased costs, faster cash flow and earned value reporting. 1000% PROJECT COST ROI...GET CONNECTED! Hard Dollar's 5D-BIM Server represents an evolution from traditional 2D CAD design through the dynamic 3D model built around a database of a project’s physical and functional characteristics, adding 4D (scheduling integration) and 5D (cost/productivity and resource loaded estimating) capabilities to complete the project cycle, creating synergy between existing systems. To date the advantage of using BIM in building projects has been for visualization and clash detection. Hard Dollar’s latest 5D-BIM Server delivers added 4D (scheduling) and 5D (cost) capabilities to drive rapid adoption by Contractors, Construction Managers and Owners. The 5D-BIM server provides a standard for data exchange throughout the construction project lifecycle, creating an integration layer that enables dynamic access to any 3rd party data across and throughout the project from design to completion. Hard Dollar’s Project Cost Management integrated suite of modules provides estimating, scheduling, project controls and analytical reporting. The 5D-BIM Server incorporates BIM integration to handle data requirements from leading industry products. Integration is available to support CAD and construction modeling solutions from Bentley Systems, AVEVA, Intergraph and Autodesk. Leverage dynamic integration with Microsoft Excel and estimating data from competitive 3rd party products including HCSS, Bid2Win, US Cost, Timberline, MC2-Ice and WinEst. Integration to competitive estimating systems provides Contractors with the ability to gain the advantages of 5D-BIM and advanced project controls without reinvesting in a new estimating software. 5D-BIM interoperability provides robust, dynamic real-time, bi-directional integration to leading scheduling systems from Oracle®, Primavera®, and Microsoft® Project. “Oneness” integration to scheduling completes the cycle of converting CAD design data into a production based cost and resource loaded schedule. 5D-BIM eliminates 99% of the labor and time requirements previously required to generate and keep in-sync a cost and resource loaded construction schedule. Bi-directional integration between the cost estimate and schedule provides dynamic cash flow and spend modeling, what-if analysis and multi-year cost escalation modeling. The integration between the estimate, the schedule and Project Controls provides highly accurate, real-time Earned Value Reporting. Collect and store timesheet data from jobsites, while sharing data electronically with accounting systems to eliminate double entry, utilizing standards to collect data from multiple sources. Maintain timesheet standards with labor classifications, and other user defined tags. Import timesheet data from third-party systems or to any accounting system. Record notes for each cost item including assumptions, jobsite observations, and more. Increase communication for issues that include staging and additional information to the field operators. Provides crew based timesheets with pre-defined data streamlining foreman or supervisor completion. Utilize over 35+ financial and ERP systems including Timberline, Viewpoint, JD Edwards, Dexter + Chaney, Computer Guidance Corporation, Oracle®, SAP, and other financial systems. Updating HD with data from your other systems is easy when using the HD API. The HD API (Application Programming Interface) provides an automated method for updating HD with data from other systems to create new records, update existing records, or delete records automatically. Application hosting enables project management teams with internet connectivity anytime-anywhere access to the entire project cost management solution, including up-to-date data and reports, under a secure redundant environment. Owners, Contractors, EPC’s, CM’s, PMO’s, gain visibility with real-time access to daily field and project performance. Hosted solutions help project managers make better decisions, which often means more cost-effective ones. Web hosting ensures that project managers, contractors and strategic partners can access and update data to keep it current. In other words, all team members are on the same page. It's true whether data comes from inside or outside your firewall. It's true whether the application is Web or client-based. Because we specialize in applications and technologies that support project teams, we accelerate project starts from months into days. The security, support and infrastructure you'll need in place pre-launch already exists, eliminating learning curves and infrastructure challenges. Hosted solutions improve the performance and effectiveness of your project management teams. It's as though your company added an IT staff to specifically support the project management function. And, each IT staff member is a project management application specialist! Global and remote work teams are backed by 24/7 application support and service, along with a robust security system. To know more on Hard Dollar solutions, please click here.